Fury as store bans food item over slip fears. 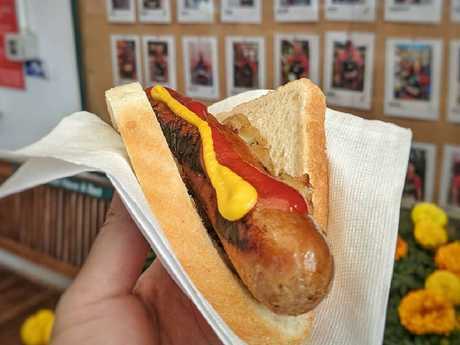 A SOUTH Australian supermarket has followed in the footsteps of Bunnings and its onion saga and banned a popular food due to fears it could cause someone to slip. Tanunda Foodland, in the Barossa Valley, has canned the age-old tradition of giving out free smiley fritz to children at the deli counter. Now if you are not from South Australia and have no idea what the hell a smiley fritz is, then you're not alone. The sliced meat is typically referred to as "devon" or "Belgium" in New South Wales, Victoria and Queensland, while some parts of Tasmania call it "bung" and Western Australian's refer to it as "polony". This sign has made a lot of shoppers very unhappy. However, in South Australia they call it "fritz", with smiley fritz being a special product that appears to have a big smiling face on it and is given to children to eat at grocery stores. 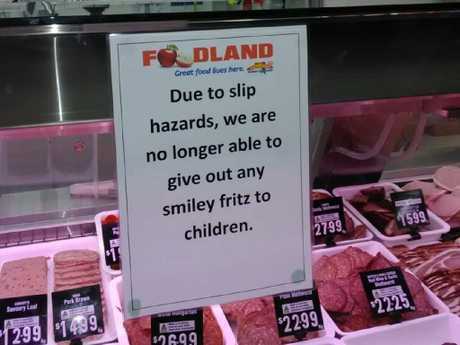 But kids will no longer have the pleasure of munching on smiley fritz while their parents shop at the local Foodland. 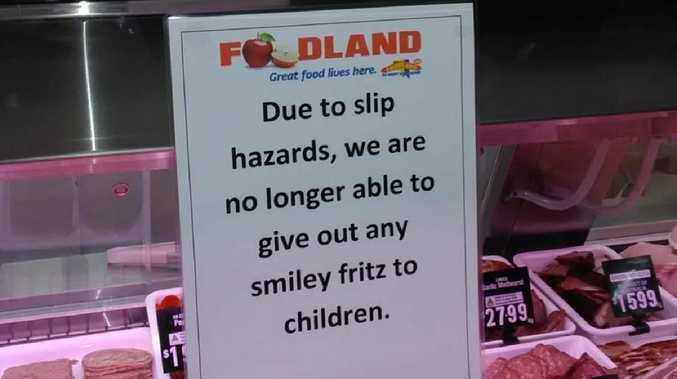 "Due to slip hazards, we are no longer able to give out any smiley fritz to children," a sign at the store's deli counter read. It is believed the ban is a result of a recent incident at the store where a customer slipped on a piece of fritz that a child had dropped, according to The Advertiser. For non-South Australians this is what smiley fritz looks like. The female customer reportedly hit her head on the floor, leading to staff filling out an incident report even though the woman was uninjured and no ambulance was called. 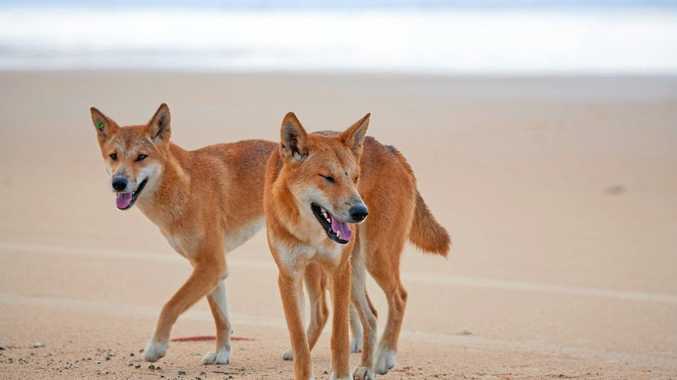 The ban caused outrage among residents, with many comparing it to the Bunnings onion saga that happened last year. The hardware store received major backlash after it announced it would now place the onions from their famous sausage sandwiches under the sausage, rather than on top, after customers claimed to have slipped on stray onions. People weren't impressed then and they aren't impressed with this change either. People are comparing the ban to the recent Bunnings onion controversy. 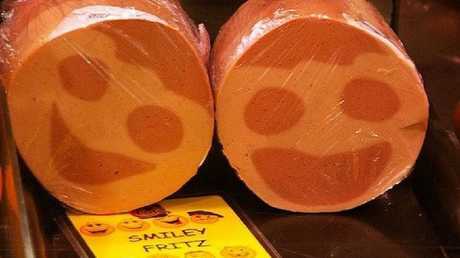 "First the Bunnings onions, now the darn Smiley Fritz, what is this world coming to," one social media user asked. Others said it was a quick way to "ruin" shopping trips for children and pointed out that it would be a small number of children actually dropping the meat instead of eating it. "Surely they could come up with a better solution rather than not handing anything out." However, there were a few customers that seemed to agree with the new rule. "Makes sense. The amount of smiley fritz you see on the floor and the parents don't care because they won't pick it up," one person said. Another agreed, writing: "The sign is only up because the parents seem to be too lazy to pick up after their child."